Scientists at Cytoskeleton Inc. recently investigated post-translational modifications (PTMs) that regulate the Rho GTPase family of proteins. Here, the authors characterized the functional regulation of RhoGDIα by SUMOylation 2/3 (SUMO 2/3) and acetyl-lysine PTMs. These studies led to the identification of endogenous SUMO 2/3 and acetylation (Ac) modifications of RhoGDIα. Interestingly, the microtubule stabilizer paclitaxel induced both Ac and SUMO 2/3 of RhoGDIa in a time-dependent fashion. These changes in the PTM state of RhoGDIα altered the protein’s ability to inhibit RhoA activity. 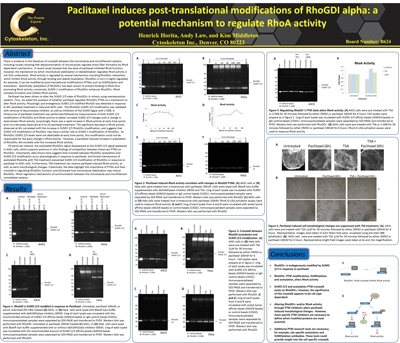 Experiments performed with the HDAC inhibitor, TSA, provided evidence of crosstalk between RhoGDIa SUMO 2/3 and Ac in a cell-type dependent fashion and further support the hypothesis that these PTMs may alter RhoGDIa’s function. Cytoskeleton's SUMO 2/3, and Ac Signal-Seeker™ PTM detection kits (Cat. # BK162, and BK163, respectively) were essential reagents in this study, providing a novel toolset for simple and effective investigation of established and novel PTMs for any target protein. Horita H et al. Paclitaxel induces post-translational modifications of RhoGDI alpha: a potential mechanism to regulate RhoA activity. Mol. Biol. Cell. ASCB Annual Meeting 2017, Poster B624.